Life Before the Dinosaurs: Falcatus. Falcatus was a one-foot-long stethacanthid shark which ate shrimp. Falcatus had a hook-shaped crest which only the males had. The crest could have been for attracting a female. But like all stethacanthids, the use for the crest is unknown. Stethacanthid means "spiny crest." Falactus lived during the Carboniferous Period and probably had to avoid Edestus and Helicoprion. 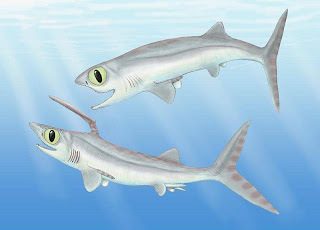 Falcatus was the most abundant shark in the Bear Gulch Beds in Montana, and individuals have been found everywhere there. But sometimes whole schools of Falcatus have been preserved. Falcatus isn't the only animal with the word "falcatus" in its name. There's also Parexus falcatus. The binomial name of Falcatus is Falcatus falcatus. The female Falcatus looked more like Cladoselache than Falcatus. The difference between the male Falcatus and the female Falcatus is that the female did not have the crest or the triangle patch of barbs on the head. The male also had a longer snout than the female. Falcatus was probably a visual predator because of its huge eyes, which were almost the size of its head. My DJ name is Falcatus falcatus.